Microsoft's Arc Keyboard isn't so much designed small because it's great for traveling—laptops already come with compact keyboards—it's more for compact spaces or controlling media center machines. I gotta say, it looks really nice, even if it's awkward. Pretty good. Like we said above, it's a very pretty keyboard, curved in the same way that their Arc Mouse is. They're two devices made with the same idea in mind: Shoving as much functionality into as a tiny space as possible. 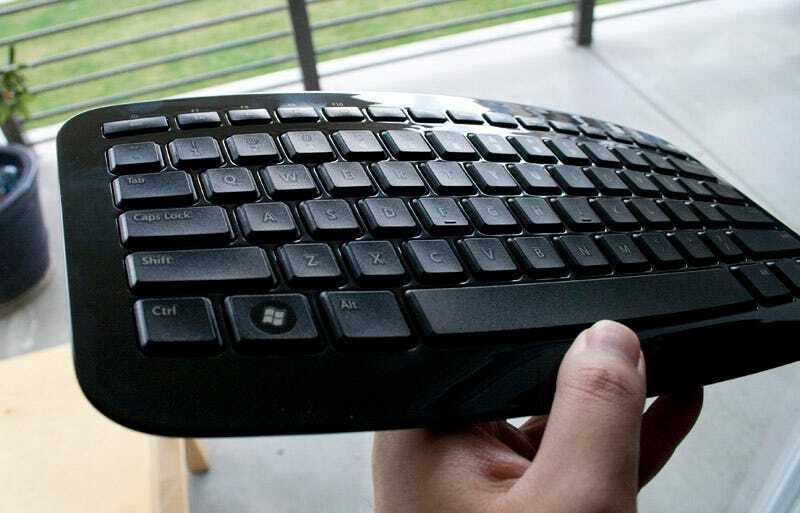 To that end, Microsoft's made a few concessions on the normal keyboard design. The arrow keys have been replaced by one 4-way key, the higher end of the F-keys have been changed out to the Home/End/Page Up/Page Down keys (and those F-keys get "function" status on top of the F1-F6 keys), and there's no numpad. The upside to these changes is that it definitely does save space, but the downside is that the D-pad arrow keys are awkward and slow to use. But how does it type? Pretty well, for the most part. The main keys move with a pleasing amount of travel, and it's more like a laptop-style scissor key than a clunky big boy style IBM key. The biggest complaint we have is that the sensitivity on the space bar seems to be low, so we often get phrases that are typedlikethis. An annoyance, to be sure, because you have to train your thumbs to mash down harder than on any other keyboard you've used. It's a pretty solid wireless keyboard to stash away when you need to do some quick typing on an HTPC across the room. The 2.4GHz wireless dongle goes into a recessed magnetic slot on the back of the keyboard for safekeeping, similar to the way Logitech has been unifying their tiny wireless dongles on their latest mice and keyboards.